Mass movements have erupted in Egypt, Yemen, Libya, Bahrain, Jordan, Oman and Algeria against the dictators and autocratic monarchs. Some pseudo-intellectuals and self-styled political leaders are trying to link up Egyptian revolution with Kashmir issue. Among Arab countries, Egypt claims five thousand year old civilization and culture. She has influenced not only the African countries in her neighbourhood but the Arab countries also have largely imbibed her contribution. The struggle for Arab nationalism under the leadership of Colonel Nasser not only pulled Egypt out of monarchical rule, but also helped her wriggle out of the nauseating influence of Great Britain and France. He liberated Suez Canal from the grip of these two countries after fighting it out. Other Arab countries such as Syria, Iraq, and Yemen also met with revolution under Ba’ath Party but those were hijacked by their ruling junta. Thus dictatorship of the junta was established in Egypt, Syria, Iraq and Yemen. In Egypt, Hosni Mubarak held power for last thirty years during which he suppressed all opposition. The leaders of Ikhwanul Muslimeen were hunted down or sent to gallows and many people contributing to their ideology were sent behind the bars. It was an era of nepotism and corruption in Egypt. Economic and social conditions did not change for ordinary people. However one thing did happen. Economic imbalance among the Middle Class and Lower Middle Class gave rise to Egyptian rule. Despotism and single party system created unrest among the people. A close analysis of the current turmoil in Egypt and other Arab countries shows that at the root lies the oppression of Israel on Palestinians. Not resolving the Palestinian issue through dialogue seems to be the main cause of these uprisings. Israel and the US both are largely responsible for upsurge in Egypt. Her assassinated President Anwar Sadaat had signed an agreement with Israel . Later on, Hosni Mubarak made Egypt a strong defense line for Israel. This had exacerbated unrest among the people. Despite all this, Israel showed no relent in its animus against Palestinians because the US lent full support to Israel. Only recently the US vetoed a UN resolution opposing Israel making new settlements in Eastern part of Baitul Muqaddas. This created a wave of resentment not only in Egypt but in all Arab countries against the ruling apparatus and there were massive demonstrations on streets. The main reason of all this turmoil is the secret support given by some Arab rulers to the Israel. They have become the stooges of the US and are only protecting American interests besides allowing American military bases in Arab countries. Arabs nurse deep hatred for the Americans. Egypt, Tunisia, Algeria, Yemen, Libya and Bahrain all consider themselves Arab countries and most of the people there speak Arabic. Thus on the basis of language and faith people in these countries consider themselves one nation meaning the Arab nation. The revolution in Egypt is for the establishment of democracy and for just and equitable distribute of economic resources and individual freedom. The biggest lesson for us from this revolution is that a revolution has to be brought about on the principles of justice, equality and democracy. It is not to raise a cry for religion and thus stoke the flames of revolution. The good thing about Egyptian revolution is that despite Ikhwanul Muslimeen having 30-40 per cent presence among the protestors, neither the slogan of “Nizame Mustafa” was raised nor was accession with any other Muslim country demanded. The protesting masses and all organizations raised slogans for liberty, restoration of democracy and personal freedom. This earned them the support of entire world so much so that even the United States of America, too, had to support the revolution. This was despite the fact that the state set up in Egypt under Hosni Mubarak was not only the biggest support to the American interests in the Middle East, but also became the first defence line of Israel. Another positive element of the Egyptian revolution is that all minorities of Egypt like the Jews, Christians and others participated in it because the majority community of Egypt, meaning the Muslims, did not paint the revolution in religious colour. The success of the revolution also lies in the fact that Egyptians of all faith demonstrated unity and cooperation as the revolution progressed. The revolution in Egypt is not yet complete: it is yet to go deep into the fabric of that society. There is cry against despotism in Yemen. People are demonstrating for democracy, for equality and justice and individual freedom. Likewise, in Tunisia, Algeria, Jordan and Bahrain mass uprising is not for faith but for individual freedom, good governance, better life standard and equitable economic conditions, all based on the principles of democracy. Thirty per cent of Bahrain population comprises Sunnis who have grabbed political power in the state and the majority of 70 per cent Shias have been denied participation in the governance and senior administrative positions. Not only that, the ruling oligarchy gives jobs to people from the Arab neighbourhood while ignoring their own nationals. The majority community is left to poverty, injustice and exploitation. This led to the raising of cry for democracy. The ruling oligarchs failed to suppress through military force the revolution in Arab countries because in the age of electronics, the entire world sympathized with the people of Egypt. Although internet was banned yet through other electronic media like mobile service the protest of Egyptians reached the ears of people all over the world. A fundamental principle has to be understood that no movement, no struggle for freedom or no effort for restoration of rights can succeed in any country unless its voice reaches the people of the world. The revolution of Tunisia and Egypt gave a new direction to the struggle in entire Middle East. Its fruits will undoubtedly reach the broad masses of Arab and African people because they have used the strongest and decisive weapon of unity among themselves. I presume that in near future crowns will be tossed aside in Arab countries and thrones will tumble down. Scared of mass uprising, Saudi king announced to allocate 35 billion dollars equivalent to 1575 billion rupees for social development, housing and education. Nevertheless, there is need for social reforms in Saudi kingdom. American military bases will be terminated and people’s rule will be established. This will induce smaller countries like Israel with a population of just 5.5 million that encircles the Arabs, to establish peace by dealing justly with the Palestinians. If the US and Israel are not able to stop exploitation of the Arabs through the source of oil then the interests of the US and Israel in the Middle East cannot be guaranteed. As far as Libya is concerned, there is turmoil in Benghazi and its adjoining areas and there is resentment against the political role of Col Ghaddafi. But those areas have the history of being at divergence with Tripoli. Egypt – type revolution in Libya seems rather impossible. A civil war on large scale can erupt there. In the case of Bahrain, Egypt, Tunisia and Algeria, brute force was not used against the demonstrators. The main reason is that there is substantial presence of Americans in those countries and there is pervasive American influence. The US had warned these countries against using force to disperse and suppress mass movement. Had force been used, it is likely that American influence in these countries would have received a set back. Thus the US wisely decided to make Hosni Mubarak a scapegoat. For the time being, the old system that protects American interest in these countries has been saved from falling apart. There is negligible American influence in Libya and that is why the position of Tripoli is different from other Arab capitals. Tribal system still exists in Libya. There are all indications that a widespread civil war may shape in Libya. For the time being the US and western countries have hijacked revolutions in Tunisia, Algeria and Egypt. The existing arrangement in these countries has so far been saved so that American interests in Middle East are protected. Let us examine the situation in Kashmir in the backdrop of what has been said above in the context of Middle East. Some political pundits and commentators are trying to rake Kashmir issue by citing the example of revolution in Egypt and other Arab countries. 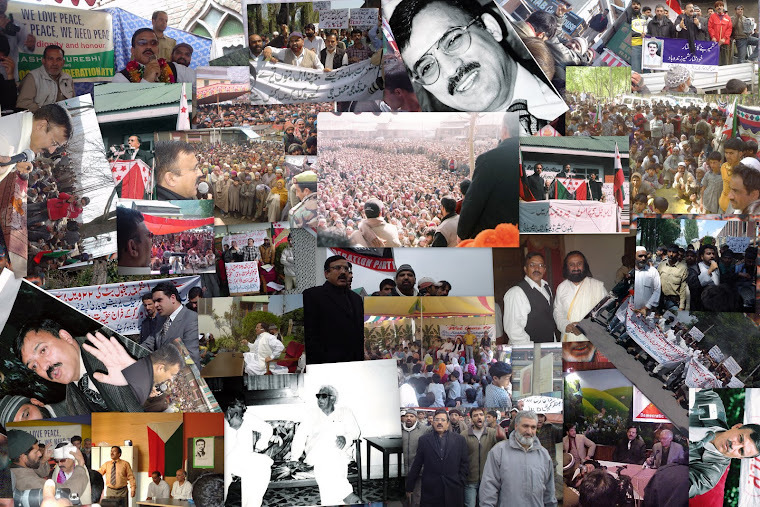 We have had mass uprisings here in Kashmir but we are for a revolution based on democracy, freedom and justice. Those citing the example of Egypt forget that Egypt is not controlled by three countries as J&K is, each having occupied a part of territory. Egypt was never in the possession of any foreign country. Her army is part of its society. American influence is to be felt in a large number of institutions in that country. Egypt did not run its movement on the basis of religion. It did not talk of accession to a country that has occupied a part of its territory. We shall also have to keep in mind that a large number of people in Kashmir are linked to National Conference, PDP and Congress in various parts of the State under Indian administration. These people cast votes to candidates from these and other parties at the time of election to assembly and thus become catalyst to the process of bringing them to power. We should also remember that the valley of Kashmir comprising an area of 6800 square miles is a small territory 132 kilometer long and 134 kilometer wide; it has been the epicenter of nationalist movement. 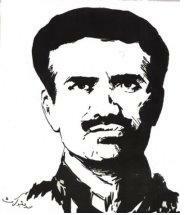 Leadership could not bring Poonch, Doda, Rajouri, Bhaderwah, Jammu, Ladakh and Kargil into the fold of the movement. 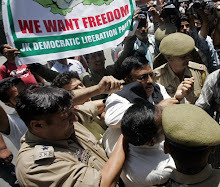 The glaring misfortune of this nation is that the Hurriyat factions claiming to be the inheritors of freedom movement explain Kashmir’s freedom in terms of accession to Pakistan. As such the J&K Movement came to be profiled as a dispute over territory between India and Pakistan. Thus the world, in spite of supporting the freedom movement of Kashmiris, started giving pieces of advice to both India and Pakistan of how they can solve Kashmir dispute between themselves. All that happens is that the world opinion just endorses the respective political positions of the two countries in Kashmir dispute. Their advice to them is to resolve the dispute bilaterally. Between 2008 and 2010, millions of people came out on streets in protest. Last year Kashmir saw a six month long strike. During past three years more than five hundred youth, children and old men lost their lives in this turmoil. Thousands were sent to prisons. Weaker sections of people were face to face with economic disaster. It is a bitter truth that not more than five per cent people know the internet blog, Face book etc. Millions of people are labourers working from dawn till dusk in order to earn two square meals. Here the leadership is torn by egoism, lust for personal fame and minor acts of self projection. They arrange small meetings in order to maintain their survival as leaders. They work for their individual survival and not for the national cause. They have no mission and no plan to that purpose. Did the local leadership ever subject the aspect of success or failure of the movement to scrutiny and analysis despite the fact that hundreds and thousands gave sacrifices for the cause? In our childhood we were told the story of an old man giving some pieces of advice to his sons at he time of his death by asking them to break a stick individually which they did but could not break the bundle. That is a lesson about unity and the strength that lays in unity. Commenting on the revolution in Egypt, Geelani Sahib conceded that there were black sheep in the rank and file of the party. 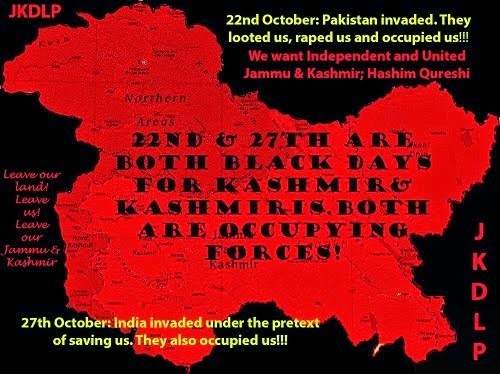 The difference between Egypt and Kashmir is that while Egyptians had their own army, Kashmir has been occupied by India. We should come out of a state of disarray and frustration and clearly state out targets meaning what precisely we want and what needs to be done to achieve those targets. Geelani Sahib accepted my old stand and said that the Kashmiri organizations and leaders still do not know what they want and how would they attain their objectives. We cannot hide our weaknesses by castigating the masses of people. People have always made big sacrifices. They have sacrificed their kids; their women met with unacceptable treatment. The onus lies at the door of the leadership and organizations as they are the prisoners of confusion. There is no consensus of opinion on any line of thinking and objective. Leaving aside some of those who were martyred in 2010, the remaining affected people should not have accepted the ex-gratia relief. Pro-movement organizations did not come forward to render succour to them. It is so because the leaders and the organizations have neither a definite programme nor unity. An impression about the separatist organizations is that they receive hundreds of millions of rupees from across the border. This money is not reserved for the support of those who make sacrifices, who suffer injuries, who have become destitute and who are put behind bars. Those raising the slogan of blood for blood should remember that unless the organizations and leadership running the movement put before them one mission, one programme and forge unity for the same, no disciplined movement, well organized and strong in purpose can be shaped. It can never reach the destination set for it. Repetition of this slogan will at the best result in shedding more blood of the youth, more oppression, more incarceration and bigger economic crisis. Article was published in 'Greater Kashmir' on 21 March 2011.